Somehow, Barb’s message did not get included in the email. Here it is now I hope. This has got to be one of the most spectacular arrangements I have seen in a long time. 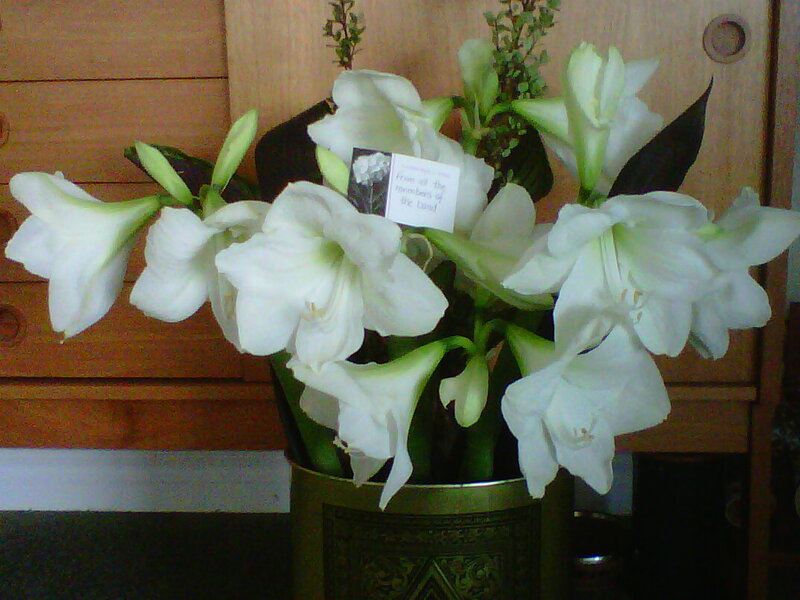 I am so grateful to the band for remembering me and for their thoughts and messages that keep coming in. I miss you all terribly and think of you all so often. I am going through a bumpy patch right now but couldn’t let this opportunity pass to thank the band so very much for their thoughtfulness. Would you please post this message (and picture) to the band members. Thank you and have a great year. We are planning on having dinner at Milestones restaurant (the old S and R building) after our concert on Friday. If you’d like to join us, I’m making reservations and will submit our number of guests by Wednesday at noon. Email me at alfano if you’d like to be included.